Exams » BITSAT » BITSAT 2019 Exam | Online Registration Closed, Check Exam Date, Exam Pattern, Syllabus, Etc. BITSAT 2019 | The Birla Institute of Technology and Science has released the BITSAT Notification 2019 on 4th January 2019 for BITSAT Application 2019. The BITSAT Application Form 2019 is released at bitsadmission.com. All students who want to appear in BITSAT 2019 exam can fill up the BITS Pilani application form and apply for the exam. But before you fill the BITSAT application form 2019, you need to first register yourself by providing name, email id, date of birth and gender. After that, the candidates can fill the BITSAT 2019 application form where you have to provide personal details, academic details, contact information and upload a few documents. Once you have filled the BITSAT application form 2019, you need to pay the required amount of application fees. The application fees can be paid online as well as offline. Only the completely filled BITSAT application form will be accepted. Every year, lakhs of students appear for this examination but the opportunity is given to only 2000 students from all over India. The applicants should have to be prepared well to crack BITSAT 2019. It is a university level examination, which is organized by the Birla Institute of Technology and Science (BITS), Pilani. BITSAT exam is an online based examination conducted for providing admissions to all the degree courses offered by BITS and its other campuses. Through BITSAT 2019, students will get admission in engineering courses. Merit List does the ranking, and hence accordingly they are distributed among the three institutes. This examination will be conducted in around 50 cities across India and in Dubai as well. 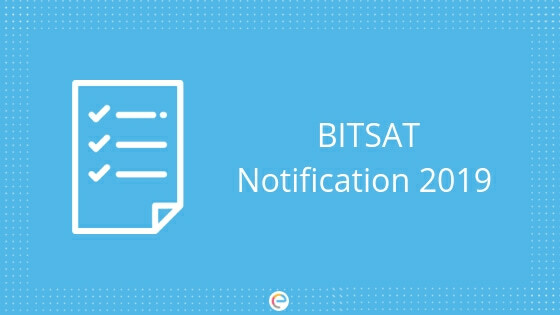 Here in this article, we are providing details about BITSAT Notification 2019, exam pattern, including the BITSAT application form, eligibility, important dates, etc. Students must go through the entire BITSAT notification before filling up the BITSAT 2019 application form. They must ensure that they fulfill all the BITSAT eligibility criteria. Important Note: At Embibe, we have ensured that BITSAT aspirants like you avail online mock tests free of cost. We suggest you attempt our mock tests and evaluate yourself to crack the BITSAT 2019. Educational Qualification Students who have passed (in 2019) or are appearing for (in 2019) 10+2 or equivalent examination from any recognized board with Physics, Chemistry, and Mathematics (Biology for admission to B.Pharm course) can appear for the exam. Qualifying Marks Candidates must have obtained 75% marks in PCM group (PCB for B.Pharm candidates) in order to appear for the exam. Step 8 Upload scanned image of Photograph and Signature. The size of Photograph should be between 4 kb and 50 kb. The size of Signature should be between 1 kb and 30 kb. Step 10 Note down your BITSAT Application Number. Also, take a print out of your application for further reference. The BITSAT application fee can be paid either through online or offline mode. An e-challan (ICICI Bank) will be generated for candidates who want to make the payment in the offline mode. Duration: The duration will be a total of three hours. Exam Mode: The exam will be conducted only in the online mode. Type of Question: The question paper will contain multiple choice questions (MCQ). As you prepare for your BITSAT 2019 to get into one of the top Engineering colleges in India, you can study 15,000 concepts that cover the entire syllabus of BITSAT 2019. Use Embibe’s BITSAT study material to finish your whole syllabus. You can also solve important BITSAT practice questions and give free online BITSAT mock tests. That’s not even the best part! If you subscribe to RANKUP, you will get test analysis after every test which will pinpoint your weaknesses and tell you exactly where you need to improve. Furthermore, it will guide you to improve your test-taking skills by helping you improve your time management skills and question selection. It will also improve your academic knowledge. Improve your score now! We hope this detailed article on BITSAT 2019 helps you. If you have any query regarding BITSAT 2019, or BITSAT 2019 Application Form or the BITSAT 2019 Notification in general, feel free to drop a comment below and we will get back to you.